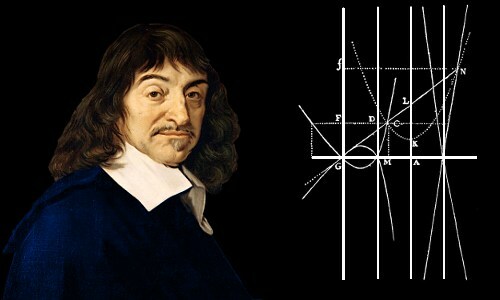 René Descartes invented analytical geometry and introduced skepticism as an essential part of the scientific method. He is regarded as one of the greatest philosophers in history. His analytical geometry was a tremendous conceptual breakthrough, linking the previously separate fields of geometry and algebra. Descartes showed that he could solve previously unsolvable problems in geometry by converting them into simpler problems in algebra. He represented the horizontal direction as x and the vertical direction as y. This concept is now indispensable in mathematics and other sciences. René Descartes was born into a well-educated, upper-class family on March 31, 1596 in the French village of La Haye en Touraine. The village is now called Descartes, Indre-et-Loire in his honor. René’s father was Joachim Descartes, a lawyer at Brittany’s Court of Justice. His mother was Jeanne Brochard, daughter of the Lieutenant General of Poitiers. René was their third child. A year after René’s birth his mother and her fourth child died during childbirth. René’s father’s worked six months of the year in the Court of Justice in Rennes, about 200 miles (300 km) from their home. René was raised by his grandmother and his great-uncle. His father remarried when René was four and began living in Rennes permanently. Despite this, there was always affection between René and his father. From birth René suffered poor health and had a permanent cough. Local doctors thought he would not survive infancy. His father employed a nurse who devoted herself to René’s care. As an adult he believed his nurse saved his life – he paid her a permanent pension. At the age of about ten or eleven René was finally considered healthy enough to begin school. He boarded at the Jesuit School at La Flèche in Anjou. In a concession to his delicate health he was allowed to rise later in the morning than other students. René spent seven or eight years at La Flèche learning logic, theology, philosophy, Latin and Greek. In his final two years he also learned mathematics and physics. The physics was that of Aristotle – almost entirely wrong. He was a boy of prodigious curiosity, asking questions endlessly. René learned something of Galileo’s work including his recent amazing discovery of Jupiter’s moons. At this time, Galileo had still not published his greatest works overturning Aristotle’s physics; his trouble with the Catholic Church lay in the future. His father encouraged René Descartes to follow in his footsteps and study law. He did this, graduating from the University of Poitiers in 1616, aged 20, with a diploma and license in church and civil law. Descartes, aged 23, was now profoundly serious in his desire to make new discoveries in mathematics. On November 10, 1619 Descartes was dozing in a warm, stove-heated room in the German town of Neuburg an der Donau. 18 years later, in 1637, he published his ideas in Discours de la mèthode (Discussion of the Method), La Gèomètrie (Geometry), Les Mètèores (Meteorology), and La Dioptrique (Optics). The first two of these works contain his most significant contributions. In Discussion of the Method Descartes shared his framework for doing science. It is ironic that Descartes’ own method might lead us to doubt that a dream 18 years earlier could have been the true source of his ideas! Descartes made the revolutionary discovery that he could solve problems in geometry by converting them into problems in algebra. In La Gèomètrie he showed that curves could be expressed in terms of x and y on a two-dimensional plane and hence as equations in algebra. 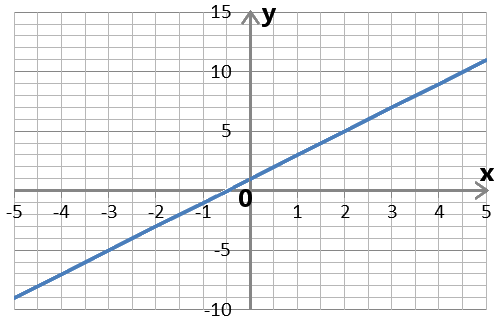 The blue line can be expressed using algebra by the equation y = 2x + 1. Descartes never actually drew an x- or y-axis in his work. These were assumed in his diagrams. The axes were formally introduced by the mathematician Frans van Schooten and other mathematicians in Leiden who translated La Gèomètrie from French into Latin, while developing it further. Latin editions of La Gèomètrie were released in 1649, 1659 and 1661. Descartes also introduced the modern notation for exponents. For example, rather than writing a.a.a he would write a3. By unleashing the mathematical power of algebra to tackle problems in geometry, Descartes surpassed the expertise of Ancient Greece’s brilliant geometers: he could now solve problems that had defeated them. Analytical geometry was independently invented earlier by Pierre de Fermat, who lived in France at the same time as Descartes. Fermat worked on mathematics for his own pleasure and often kept his results private. He did, however, enjoy issuing challenges to other mathematicians to solve problems. In 1638 Fermat sent a work entitled Introduction to Plane and Solid Loci to the mathematician, Marin Mersenne, to show how problems he had posed at an earlier date could be solved. Fermat’s approach was different from Descartes’. Descartes showed how geometry could be expressed as algebra; Fermat showed how algebra could be expressed as geometry. Calculus has been crucial to the progress of mathematics and the sciences. It was developed in the 1660s by Isaac Newton, and developed independently in the 1670s by Gottfried Leibniz. In La Gèomètrie, Descartes showed how he could find tangents to curves. This process is a vital part of differential calculus. His mathematical competitor Fermat was also able to find tangents to curves; his methods were actually simpler than Descartes’. Both Descartes and Fermat helped guide Newton and Leibniz’s development of calculus. Four years before he released his 1637 works, Descartes had intended publishing The World. In 1633, however, he learned that the Catholic Church had tried Galileo for heresy and sentenced him to life in prison. This was reduced to permanent house arrest because Galileo was rather elderly. The Church also prohibited Galileo’s works. Descartes regarded this statement as the unshakeable foundation that all other philosophy could be built upon. His most famous philosophical work is Meditations on First Philosophy, published in 1641. Descartes’ most comprehensive work, Principles of Philosophy, was published in 1644. In it he tried to deduce all of nature’s laws from first principles. Although the book had much to commend it to philosophers, its science was incorrect. He argued that action at a distance is impossible and agreed with the Ancient Greek philosopher Aristotle that there could be no vacuum. Soon, however, all his power as a philosopher would be defeated by scientific experiments. In 1654 Otto von Guericke constructed the first vacuum pump. In 1662 Robert Boyle demonstrated that the magnetic force can travel through a vacuum, establishing that action at a distance is possible. Unfortunately Descartes did not live long enough to learn of these developments. Descartes was wealthy enough to pursue his own interests. His father gifted him a number of properties which Descartes, at the age of 24, sold. This raised enough money for him to live on comfortably for the rest of his life. Descartes spent much of his life on the move. He lived for 20 of his later years in various locations in Holland. He also studied and taught mathematics there. He found he could work better in Holland, with fewer distractions than in France. Although he never married, in 1635, aged 39, he became a father. His partner was an Amsterdam servant, Helena Jans van der Strom. Their daughter was named Francine. Mother and daughter lived with Descartes in his house – he told people Francine was his niece. He planned to educate his daughter in France, but sadly, at the age of five, she died of scarlet fever. Francine’s mother later got married, with Descartes playing a fatherly role by paying the wedding dowry. In 1649 Descartes was invited to Stockholm by Queen Christina of Sweden. She wanted him to set up a new academy of science. René Descartes died, aged 53, of pneumonia in Stockholm on February, 11 1650. He was buried at the Adolf Fredriks Church in Stockholm. In death, as in life, Descartes was mobile. 16 years after his first burial his remains were moved and buried in the Saint-Ètienne-du-Mont church in Paris, France. In 1819 his remains minus skull and finger were moved again, this time to the Abbey of Saint-Germain-des-Près in Paris, where he now rests. In 1663, despite his efforts to avoid such a fate – he regarded himself as a devout Catholic – a number of Descartes’ works joined Galileo’s on the index of books prohibited by the Catholic Church. Over 300 years later, in 1966, this index was finally discontinued. "René Descartes." Famous Scientists. famousscientists.org. 16 Jun. 2016. Web.